Through every challenge, every adversity, and every triumph, I find this proven to be true. Our capacities are constantly challenged in a struggle. However, if you have faith and believe in your cause, success will be inevitable. Hello! My name’s Farrokh Farhangian. I completed my studies in the city of Songhor in Kermanshah Province in the ‘80s. I was a young and energetic student back then. I was so energetic that at times no body could put up with me. I was almost 16 when they arrested me on charges of providing financial assistance to the opposition PMOI. Luckily, I was freed shortly after due to my family’s prominence. But freedom didn’t last long. A few months later, I was arrested again for continuing my political activities. This time around, I was taken to a detention centre with no bright future prospects: the dreadful units of Kermanshah’s Dizelabad Prison. I was beaten all over by cables to make forced confessions against my friends. This was followed by harsh, crushing physical and psychological torture. After this stage, I was transferred inside the Dizelabad Prison where I had to spend every hour of every day for four years of my life, from 1981 to 1985. Numbers found a new meaning in prison, a meaning which was quite different from what we had studied at school while solving equations and making calculations. Now, they represented the number of executions at nights, the number of kicks and the strikes of the whip… The number of executions often exceeded my imagination and speed of calculation. Papers and words, in contrast to school where they were instruments for promotion of knowledge and mental talent, had found other uses in prison: to record the decision to resist or to give in under the breathtaking moments of interrogation. Love and affection, that used to be a mother’s everyday gift of pure emotions, had turned into every woman’s main asset in prison to give support to fellow inmates and enhance their faith. Let me put it this way: prison is a place where you are constantly forced to choose. The choice is between giving up and surrendering to humiliation and torture or resisting with an iron will to survive and continue the path. I remember that once, a few days after my interrogation was over, some fellow inmates saw my back that had been bruised by beatings of the cable. They gave me what I needed most in those days: trust, a priceless and rare gift in prison. Although I had a sentence of only one year in prison, they kept extending it up to four years and eventually sentenced me to “suspended execution.” What that meant was that if I made any mistake upon release, I would be sent straight to the gallows. As a result of my family’s efforts who ended up paying a very heavy bail, I was released in 1985. The day I came out, I was no longer the person I was four years ago. 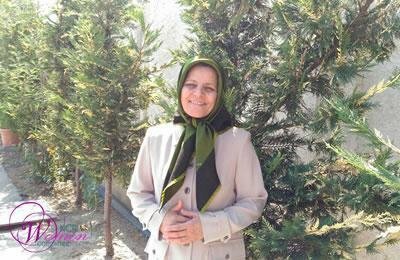 I had decided to join the Iranian Resistance and I started my efforts on the very first day I was freed. I had to search a lot to be able to contact the PMOI. There was always a voice within that directed me and propelled me to continue my search. That was what enabled me to eventually reach this big family. Looking back at those bitter sweet days, from the very beginning when I started making financial contributions to the movement, to the years of imprisonment, and then fleeing Iran to join the Resistance, followed by the years of endurance in camps Ashraf and Liberty, I can say that having a cause and being ambitious about it have guided me all the way through to where I am today. Willpower allows you to move forward and become resilient instead of giving up in the face of challenges. You will see that you become increasingly motivated to endure and overcome problems to see that victory is achievable. In my experience, prison served as a university where I learned that struggle begets change and eventually will lead to freedom. I am confident that we, women, can take the gift of freedom to our country and I can already envision the happiness of my fellow countrywomen when equality is realized in our homeland.